KMT will provide the first continuous sampling across the remarkably thin interface between magma and the geothermal system it drives: from solid rock to all-liquid magma. A string of implanted thermocouples will be permanently emplaced to make the unprecedented measurement of thermal gradient above, and hence heat flux from magma. 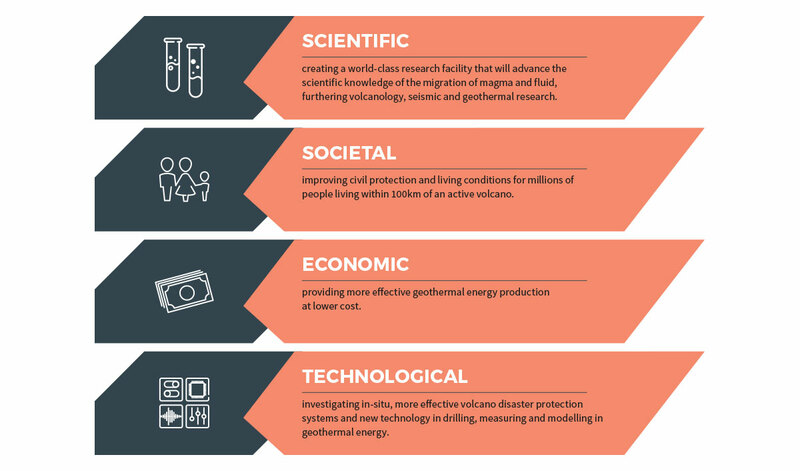 Intellectually, this endeavour will for the first-time unit the communities of practice of volcanology, geothermal engineering, and sensor technology. Magma and hydrothermal systems will for the first time be seen as only parts of the closely coupled whole. In addition, innovative casing design will address the major cause of damage to all superhot wells to date: expansion and contraction during extreme temperature excursions.